Though safety razors have been around since the early 1900s, they have only recently started making a comeback. These razors have a certain regality to them and provide wonderful shaving results. What do you think is the best safety razor for most men? Vote for your favorite brand or leave a new review below. 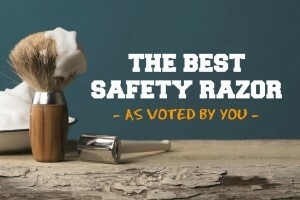 While we have experience with many different brands of razors, we wanted to hear your opinion on the best safety razor. Although we received a wide range of responses, the top result didn’t surprise us. 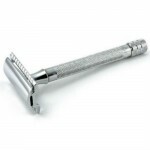 The Merkur Long Handled Safety Razor (check price) was the top recommended safety razor suggested by our readers. It’s no surprise because the company has been around for ages and provide quality shaving products made in Germany. The razor has a chrome finish and long handle, making it easy to for those with large hands to hold. If you prefer a shorter handle, that is no problem. The product allows you to choose from a standard 4-inch handle, extra long, or slim with a guard. Safety razors are also known as double-edged razors. These types of razors use a single razor blade with two sharp sides on either side of the razor handle. The handles are designed in a way that only exposes the skin to the very edge of the razor, thanks to a protective guard. Prior to multi-bladed razors, these were the standard. Today, there is a popular misconception that more blades equals a closer shave. But this is not always so. When you shave with a multi-bladed razor, dead skin cells and lather can clog the blades while a safety razor cannot be clogged. The blades of a multi-blade razor dull over time and the entire head of your razor needs to be replaced with a new cartridge. This eats away at your budget without you even noticing. What are the Benefits of Using a Safety Razor? So why would you want to choose a safety razor over a multi-bladed razor? There are several benefits. The first being affordability. The replacement blades for a safety razor are much cheaper than those for a multi-bladed razor. The two sides of the razor also allow you to extend each blade’s lifespan. On average, an 8-pack of multi-blade cartridges costs around $20, while a pack of 100 safety razor blades only costs $9.50. If you do the math, you will quickly discover the amount of savings such a simple change creates. A safety razor’s thinner design makes it easier to reach and remove hair in areas around the nose and your neck crevices. Those who use this form of razor swear that it provides a smoother and closer shave when compared to their multi-bladed razors.